George Borrow – brilliant linguist, expert on gypsy culture and author of “Wild Wales” (1862) – remains an enigmatic character whose fiction and travel writing mix autobiography and invention. From 1835 to 1840, he worked as an agent of the British and Foreign Bible Society, attempting to distribute Protestant Testaments in fiercely Catholic Spain. The outcome of this controversial and risky enterprise is – though not the one that his employers expected – as “The Bible in Spain”, an account of his wanderings published in 1843. The book, a classic of travel and observation, has been in print ever since. A century and a half later, Borrow enthusiast Guy Arnold followed in the footsteps of the restless and eccentric Bible salesman, tracing his route through Spain and Portugal. Visiting the same places, staying where possible in the same inns, and taking the same roads, Arnold explored the varied landscapes and cities of the Iberian Peninsula in a journey that took him through Madrid, Lisbon, Toledo, Seville, Cadiz, Salamanca and Segovia as well as many small towns and villages. Braving blisters, angry dogs and over-inquisitive hoteliers, Arnold walked over a thousand kilometres, taking buses and trains where Borrow had used horses, mules and carriages. In the course of his journey, he looked at cathedrals and churches, palaces and convents, castles and ruins. He also encountered a broad cross section of humanity, Spanish and foreign, on the long road. 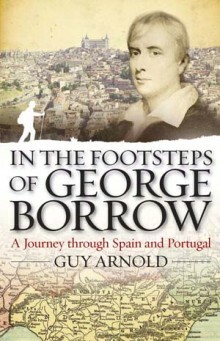 “In the Footsteps of George Borrow” brings to life the scenery and culture of Spain as well as the complex personality of the man who described it in the 1830s. In the course of his travels, Guy Arnold considers Borrow’s ambiguous religious beliefs, his avowed taste for the social lowlife and his mysterious liaison with a widow from Norfolk. He also compares modern Spain with that of Borrow’s time and finds – civil war and brigandage apart – that much remains surprisingly the same. Guy Arnold is a freelance writer and lecturer, specialising in international affairs. The author of more than forty books, his travel writing includes Down the Danube and Journey Round Turkey.